Interpretations of Fed Governor Lael Brainard’s speech on Tuesday, May 30th, to the New York Association of Business Economists were wide ranging: some thought she has shed her dovish feathers, others that she is signaling uncertainty at the FOMC concerning the direction of monetary policy. We read her talk as a continuation of her focus on ongoing weakness in inflation despite, as she put it, the growing number of forecasters who believe the U.S. economy is at or very close to full employment. We’d like to look beyond the immediate implications for monetary policy in her talk and highlight some underlying premises. Part of that is admittedly because we think she is making important points but, hey, with rates heading up we will need to shift the conversation to the issues beyond the reach of interest rates. The sooner the better. In her opening remarks she notes that we are currently seeing a synchronized expansion, which has moved global risks in a positive direction, and forecasts are moving up, which has broken a string of downward revisions. She is encouraged that the U.S. Labor Force Participation Rate has held steady even while facing, “what many believe to be a downward trend in demographics”; the employment/population ratio is at a post-recession high, and those working part-time against their wills is close to its pre-crisis level. The U-3 employment rate, the “official” rate, is now at its 2006/7 cyclical low, although she notes that the rate was at and below that level in the late 1990s. If all continues to go as preliminary data for the second quarter suggest, the federal funds rate will be well on its way to neutral and the FOMC will turn its attention to the balance sheet soon. But. Brainard quickly moves to the “tension” between the signs that we are reaching full employment, and the possibility that “tentative progress on inflation…may be slowing.” If progress on employment and the lack thereof on inflation persist, she will reassess the path currently outlined for both the funds rate and the balance sheet. One concern is the unemployment rate, but not quite what you’d guess. What worries her is that in the past when the unemployment rate has been as low as it is currently, it has been hard for expansions to sustain themselves. With very little growth in the labor force, it’s hard to keep GDP moving. And, we’d add, even without law changes, a bellicose attitude toward immigrants could flatten what growth we are seeing, and even cause a contraction—or at least severe distress in industries like construction, restaurants, and even tech. Brainard notes that in the past rising inflation has sounded the “death knell” for expansions, but that inflation expectations have been stable in the most recent expansions. From 1998 into 2001 core PCE inflation never exceeded 2% on a four-quarter basis, and the high of 2.4% in 2006/7 was a pass-through in import prices—in other words not a child of durable wage inflation. Calling the Phillips Curve a “less reliable guidepost” than it once was, Brainard turns to inflation expectations from the Michigan Consumer Confidence survey, which remain near their all-time low, although the New York Fed’s measure of three-year inflation expectations rose to its highest level in more than a year. Market-based measures of inflation compensation have improved, but remain below the average that ran between 2010 and 2014. She sees more signs of a slowing in inflation than an upside break, which she thinks may be the result of the non-linearity of inflation and unemployment when unemployment is so low. The flatness in the Phillips Curve is also apparent in European economies. Brainard wonders if NAIRU is currently lower than it was, which makes sense to us, or if perhaps the U-3 is overstating the strength of the labor market. The employment/population ratio for prime age workers remains 1 point below its pre-recession level. She didn’t mention the quit rate, which is improving slowly but remains soft in many sectors by long-term standards, which we detailed recently and would argue has a lot to do with weakness in wage growth. We put together an estimate of the quit rate between 1967 and 2000 using job leavers and short-term unemployment (the quit rate tracks those unemployed for less than 5 weeks very closely), and then switch to the Job Openings and Labor Turnover Survey’s measure, which began in 2000. Using the longer run quit rate, the current rate would be historically consistent with an unemployment rate of 6.3%; using the JOLTS period only, 5.1% Back in 2014 the quit rate was implying an unemployment rate of 7.7% instead of the 6.7% it actually was, so it’s a long standing disparity. The wage piece of the U.S. labor market is having a tough time getting off the mat; if you put theory and ideology aside and listen to what people are saying, worker insecurity is a big deal these days, and compensation packages are far from what they once were. The Beige Book reported that employers are lifting wages to attract employees, but we don’t think that will overpower the long-term degeneration in wage structures that has occurred since the financial crisis. Brainard didn’t change anything on her favored approach to reduction of the balance sheet, subordinated to changes in the funds rate—predictability rules at the Fed these days—and she reiterated that the balance sheet itself would come into play should the economy experience adverse surprises during the normalization process. Revenues at the state level continue to do OK, if running below past performance. We believe that that relative weakness is itself another measure of the divergence between growth and prices evident in many data series, and Governor Brainard’s focus. Productivity is one of our obsessions, and it should be a national obsession as well. * Clearly it isn’t. The industry statistics presented here show that for a lot of industries, the last couple of years have been a real bust. 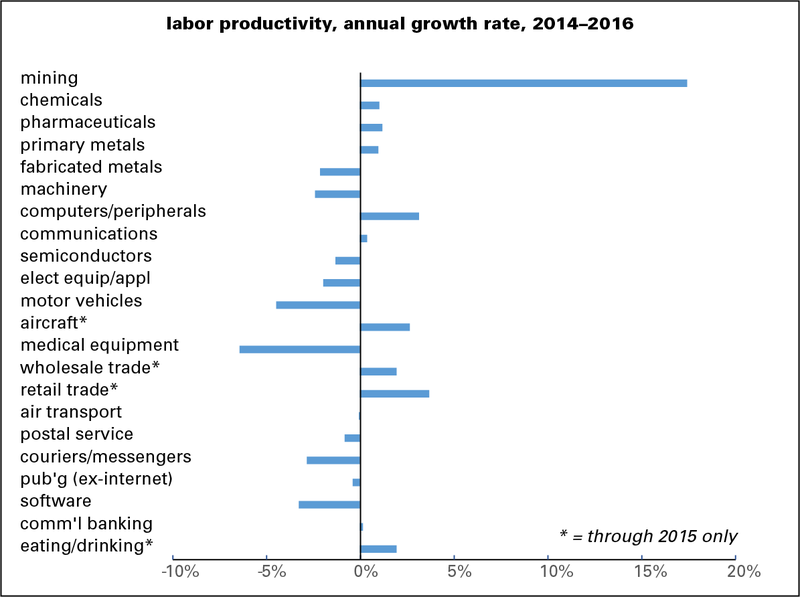 The stats, provided by the Bureau of Labor Statistics, cover scores of industries, with the manufacturing sub-sectors particularly finely broken down. Here we’ve provided what is fashionably described in some circles as a “curated” list of industries, since the whole set is beyond our scope. First the long sweep, from 1987 (when this series begins) through 2016, graphed below. (The 2016 data isn’t available for all industries; those for which 2015 is the terminal year are marked with an asterisk in all three graphs.) The standouts are, not surprisingly, in high-tech: computers, semiconductors, and software, all with annual gains in the double digits. Some old-line industries, like motor vehicles, aircraft, and wholesale and retail trade, turned in solid performances. Eating and drinking establishments and, perhaps surprisingly, pharmaceuticals did quite poorly, with pharma slightly in the red—an amazing, if invisible on the graph, feat for such a technology-rich enterprise. 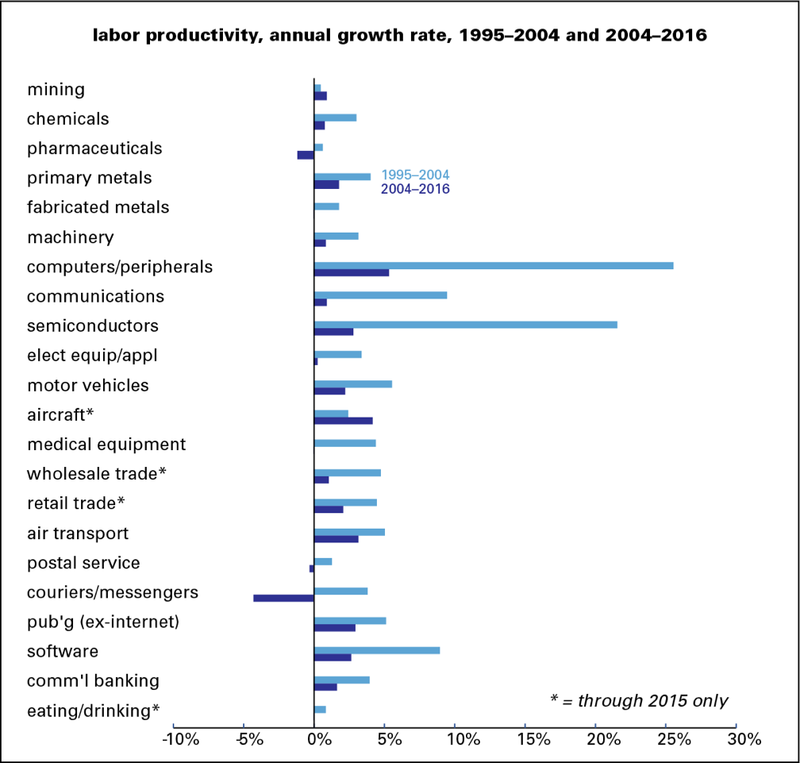 And perhaps even more surprisingly, the postal service did better than private couriers and messengers, where productivity declined over the almost three-decade interval. But as the graph below shows, most of the stellar performances were logged during the productivity acceleration of the late 1990s and early 2000s. Of the 22 industries shown, 20 saw a decline between that period and the last twelve years—a decline of over 4 percentage points on average. Only mining and aircraft showed a pickup. Computers and semiconductors fell by around 20 percentage points. Pharmaceuticals went from positive to negative. And the last couple of years have been fairly terrible. Half the industries showed a decline in productivity. Only mining—fracking, one assumes—had a strong performance. Computers remained in the black, but semiconductors fell below zero. Motor vehicles and medical equipment were firmly negative. 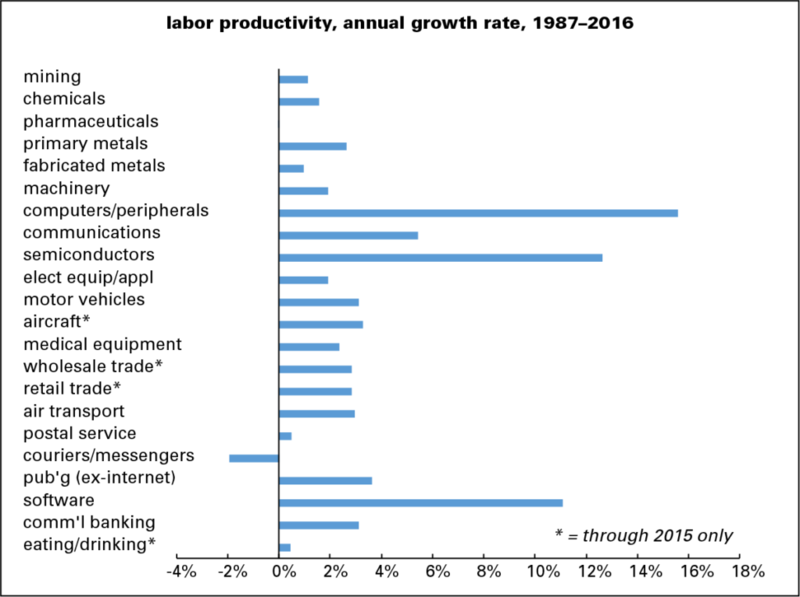 The productivity slowdown that we’ve been following at a high level is a pervasive problem at the industry level. * For those of you not so obsessed, productivity determines our standard of living. An increase in productivity means greater output from the same input, which makes labor more valuable, which in turn lifts wages. Too many corporations are currently using their profits, and money borrowed on the cheap, to buy back their own stock and pay dividends to their investors instead of investing in productivity enhancing research & development, and physical capital. That’s one of the big factors in sluggish wage growth.